Build text sequences for your business. 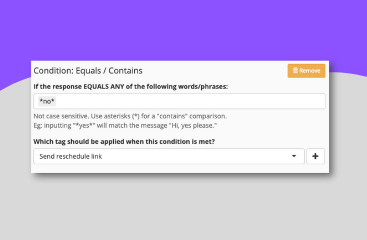 Great for text to opt-in, consultation confirmations, and conditional SMS messages where you automatically reply based on the response you receive. Write up your text messages in our text builder. Add images, GIFs and links as you like. See the number of characters your texts will use up. Create rules so you can do things like send a PDF if they text you a phone number. Reply back with a reschedule link if they answer "No" to your consultation confirmation. The possibilities are unlimited. 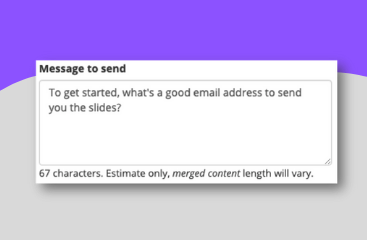 Choose how you want to launch your SMS sequence. Start it when someone texts a keyword to your number. Or initiate it with an http post or webhook from your preferred marketing platform. Amazing Plugin for Infusionsoft. I use the SMS Sequences Feature to create an almost Artificial Intelligence chat with my prospective clients to make sure that they show up to their consultation appointments. Along with the Humanize Date Feature, I am able to make it seem to the prospect that I am actually interacting with them - when in reality its PlusThis doing all the work.